Crosley CR6002A Revolution, Portable Record Player Transmits to your FM radio! It's Weird and Wacky, 'Space-Age' looks will astound you. It's truly 'Portable' and as it's capable of battery power, can stand alone anywhere. Ok, this turntable is not for everyone, but it will definitely fit some 'unique bills'. It's weird and wacky, 'Space-Age' looks will astound you. It's truly 'Portable' and as it's capable of battery power, can stand alone anywhere. It is designed to be a novel way to get your vinyl sound onto your stereo system via it's 'line-out' jack or FM transmitter, your portable radio in the kitchen via the FM transmitter, or other similar use. One great use that a few customers have made us aware of is for showing their vintage 1950's, 60's and 70's American Iron, cars at car shows. You just display it on the hood of your '57 Chevy, '66 Malibu, '71 442 Cutlass or other great car, tune the FM radio (unless you only have an AM, in which case you're 'hosed') put on an album or 45 and you're cars' stereo is 'rock'in the show'. 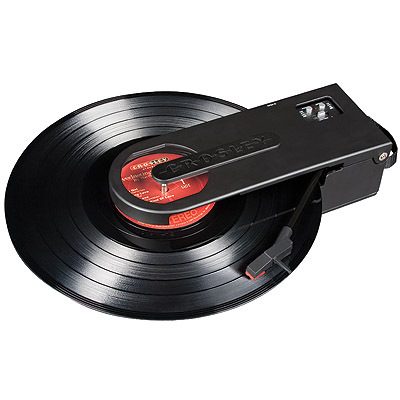 The Crosley 'Revolution' turntable is USB enabled for connection to PC and Mac and includes a software suite for ripping and editing audio content. Transferring / recording your LP's and Cassette Tapes to CD is as easy as using the included 'Audacity' software. Ok, I have to vent here...While this Crosley does have a built in speaker, let's put this in perspective. I read reviews out there about how the sound is 'lacking from it's internal speaker' or 'it sounds thin' or 'not audiophile quality'. DUH!!! Are people now that out of touch that they are unaware of what a small, 3-4" single speaker, in a small plastic housing would sound like. Yes, I think they must be. The internal speaker is primarily for monitoring / checking what is on a record, and not for 'audiophile' listening. Anyone who considers themselves some degree of a defined 'Audiophile' would not be considering a portable unit such as this as anything resembling 'audiophile-use' in the first place. Think about it! It is what it is, a uniquely designed, portable turntable and a great conversation piece while playing (preferably through your stereo system either via FM or Line-Out/In). It's reminiscent of the 1980's, Sony SP-F5, that looked very similar (except it was not capable of USB output and did not have a built in speaker, the latter of which was probably a good thing). Another 'complaint' I read about was it's limited FM broadcast capabilities of only 10-20 feet. That's an FCC regulation issue and not Crosley. Some individuals are certainly quick to complain aren't they. Ok, I'll get off my soapbox. AC or DC powered (For AC power simply utilize the INCLUDED AC power adaptor. For portable / DC use install 6x AA batteries (not included)). This a unique unit, who's 'looks' are to be appreciated as it's primary 'draw'. I'm assuming if you weren't intrigued by it's looks, you would be considering the purchase of a normal turntable.?. Right? If you are considering this turntable for what it IS, then you'll likely LOVE IT! Now comes with a 1 YEAR limited warranty up from Crosley's previous, 90 Day limited warranty. Dimensions: 11" x 3.25" x 4.25" & ~4lbs unpacked.